Special envoy to the United Nations for climate change Michael Bloomberg addresses the media at the One Planet Summit, near Paris, Dec. 12, 2017. Former New York City Mayor Michael Bloomberg announced Sunday he is giving $4.5 million to the United Nations Climate Change Secretariat to cover a U.S. government funding gap for the international Paris climate accord. Bloomberg's charitable foundation said the money will support work developing countries are doing to achieve their targets under the agreement as well as "promoting climate action" among cities and businesses. The 2015 treaty signed by more than 200 nations and entities vowed to curb carbon dioxide and other greenhouse gas emissions in order to try to limit global temperature rise. Former President Barack Obama's administration was among the signatories, but President Donald Trump said he would pull out of the agreement. Trump campaigned as a booster of fossil fuels and a skeptic of climate change science, and said the Paris accord would cause U.S. businesses to lose millions of jobs. 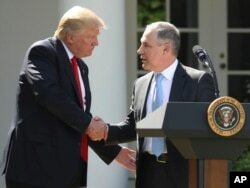 FILE - In this June 1, 2017 photo, President Donald Trump shakes hands with EPA Administrator Scott Pruitt after speaking about the Paris climate change accord in the Rose Garden in Washington. "This agreement is less about the climate and more about other countries gaining a financial advantage over the United States," Trump said last year. Bloomberg made a similar payment last year and pledged to continue the contributions. He told CBS News in an interview broadcast Sunday that Trump is capable of changing his position. "But he should change his mind and say, look, there really is a problem here, America is part of the problem, America is a big part of the solution, and we should go in and help the world stop a potential disaster," Bloomberg said. The United States is among the world's top emitters of carbon dioxide. But in late March, U.N. Secretary-General Antonio Guterres said that because of the actions of businesses and local authorities, the U.S. "might be able to meet the commitments made in Paris as a country." Guterres appointed Bloomberg as his special envoy for climate action in March. Guterres tweeted Sunday thanking Bloomberg "for his generous support to the United Nations but also for his global leadership on climate action." Last year was the third warmest year on record. Scientists increasingly see evidence of climate change in heat waves, storms and other extreme weather.